Heidi is helping spread the word about Stockings for Soldiers and this year is trying to rustle up over 700 ATCs. Help a gal out, will ya? Added bonus: an online tartan maker. Coolness! I expect to see your blog all plaided up now. Something must have struck us lately, for most of the week we’ve been somewhat zombie-fied, tired andlethargic. No other sick symptoms than a runny nose, which I chalked up to allergies or reactions to all the dust from the fields. One night we even just lay there watching a movie in my bedroom – with no sound but the subtitles on. It wasn’t until I tried to scrunch lower down under the covers that I realized someone short-sheet my bed. I leaned over and smacked Ron on the arm. “WHAT?” he laughed. Sarah came in while I was still ranting at Ron, and she was grinning. You’d think with her birthday around the corner she’d wouldn’t be up to no good like that. Otherwise, it’s been quiet. Ron did redo the dryer vent to the outside. I wanted to take pictures of the before and after, but he said it’d require too much explaining and was too head-shaking. We also stood around in the basement looking at the plumbing. It is a spectacular example of how to use as much pipe as possible. One section even does a u-turn, and anothe, instead of going straight across, goes left then two rights to get to the same point. Pictures when we get to fixing that who knows when. We had weird weather too. It was cloudy, darkly overcast, sunny and hot, gale force winds then rain. And that was just YESTERDAY. Fall colors are starting to get really bright here, so I think we may go on a photo hunt soon. With the cold, we’re thinking about how we’d like to heat the house. There’s a sorry looking oil furnace down there, so we’re weighing the cost of gettign that running and a tank of oil (ew) versus something like a pellet stove. And Thanksgiving is next weekend, so I have to cook for whoever is going to show up. I know, I’m boring today. 🙂 I had tons of ideas that all fly away when I open the “write post” window. *sigh* I bet a million little things will happen now. Carrie tagged me for thsi meme. – when you forget when kids are supposed to be in school. – when your personal collection of reference books on ancient Egypt rival that of the local library’s. – you subconciously start planning a unit study when introduced to a new topic. – if for some reason (you’re tired, probably) you answer your kid’s question with an “I don’t know” they suggest you Google it for them or round up some books on the subject. – Even Dad will stop at book sales. – home repair jobs around the house turn into a learning experience. – the phrase, “If it’s broke, let’s take it apart” brings *everyone* running to come see. – Your bedtimes are off-schedule to everyone else’s. If you haven’t been tagged, feel free to snag. We took an impromptu road trip today, and wound up in my favorite huge fabric store. One I don’t go to very often (like once every couple of years) because I’m either not sewing or I know I’d spend money. I’ve got a few sewing projects coming up – namely, heavy window coverings for our old and draft single-pane huge windows. So we went looking for suitable fabric. I actually like taking Ron into a fabric store. He’s got a good eye and good taste and he piles on more bolts than I would. 😉 He was the one who found the *quilted* burgundy fabirc just wide enough for the windows and 3.5 meters left for $2. Yeah, that said TWO DOLLARS a metre. I was rifling through a bin of discounted flannel when I mused out loud how great he is. The lady next to me said she wouldn’t ever get her husband in the store unless they sold guns. 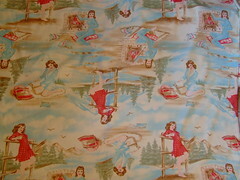 I confess I gushed a little about Ron, and right when I grabbed a bolt and fawned over this *cute* retro pinup girl stuff, he popped his head around the corner with another bolt of the same fabric in hand. She turned to me and said, “Oooo, he’s gooood.” I know. More pics and stuff later. I’m still recovering from the constant chatter all the way home. Enough with the crap in my sidebar! That’s when I’d had it. I already knew I wasn’t going to add yet another similar ooo-shiney “thing” in hopes that I would somehow become the new Dooce magically overnight. Already I’ve lost two regular commentors (that I know of) due to the site not loading properly because of things on the sidebar. I’ve decided to do the ultimate traffic experiment. Today I’ve taken out all the cruft. The ads are staying as they either pay the bills or they’ve proven to bring real traffic, like the Blogher ad links on the side there. And those ones I *do* have some control what is linked. On the rest, I don’t. I figure that each time I add a new one and tinker with it, and check my stats and obsess over it, I’d have time to write a whole new blog entry. And that’s what blogging is ultimately about – the writing. The content, remember? Is this blog here for visits or to establish a relationship? Do I want a thousand clicks over here by people who don’t give a crap and will never return, or a hundred readers who get warm fuzzies after they read about our latest adventures? People I can establish a relationship with and share the inside jokes. Sure, there are some days when nothing funny or amusing – or even exploding – happens here, but some days I get caught up so much in the backend of the blog that there isn’t even time to write a quick cute story. And stuff is piling up from yesterday, even. Another thing I’ve noticed in reading a pile of blogging-related blogs lately is – they are (for the most part) the same. Most places give the same advice, over and over, reworded and reworked slightly. I wound up skimming quite a bit through the repeated (and bolded and italicized) information hunting for good stuff. And there wasn’t. Take back your blog. Clean up your sidebar. Free up time to write. Your readers will thank you. Hopefully, my readers will thank me for it too.